(ECNS) – A non-governmental organization (NGO) report has revealed that 121 waste incineration plants in China have refused to disclose data on their pollution emissions, especially the whereabouts of fly ash, according to caixin.com on Wednesday. The report suggests that fly ash, which originates from the burning of household rubbish, is not fully understood and could be more damaging than was previously thought. In addition, pollution such as dioxin levels has been under-publicized, and the burning of household rubbish is also causing severe air pollution in China. The report was coordinated by the Wuhu Ecology Center and Friends of Nature, both NGOs concerned with the protection of the environment. In 2014, the two NGOs asked 103 environment bureaus to press 160 waste incineration plants to disclose pollution information. Little dioxin or fly ash information was provided. Plants from major cities like Beijing, Shanghai and Guangzhou failed to return adequate reports. They also refused to disclose any dioxin information. Fly ash has been severely mishandled in China, and has even been used as a construction material, or put in “temporary storage” for years. Nearly a quarter (39 out of 160 plants) provided fly ash information. Of these, 26 dumped fly ash into landfills and five used it directly as a construction material, though both contravene environmental policies. Only eight plants followed guidelines and sent fly ash to qualified waste management companies. Functioning waste incineration plants have been breaking rules by over-releasing pollutants into the air, including smoke (30.8 percent above legal limits), sulfur dioxide (25.94 percent), oxynitride (21.53 percent) and carbon monoxide (11.28 percent). The largest Chinese cities are facing pressing problems of “waste besiegement,” according to a report conducted by Renmin University of China. Local governments prefer to burn rubbish because of its effectiveness in reducing waste volumes. A large number of waste incineration plants are under construction, with the total number potentially exceeding 300 by the end of 2015. Zhang Jinling is picking cardboard boxes from a trash can on the side of the road in a downtown area of Shanghai. She empties the boxes, folds them and puts them on a trailer hitched to a bicycle. She also buys cardboard from residents in the houses on the same street, purchasing it for 2.5 mao (less than 3p) for a pile. When her trailer is full, she takes the load to a recycling market on the outskirts of the city where she sells each pile for a 1p profit. Markets like these sort waste into different materials and sell it to bigger markets where it ends up at big industrial recycling plants for individual materials. Jinling is one of hundreds of thousands of waste pickers working in cities acrossChina sorting through other people’s rubbish, removing and sorting anything that can be recycled and selling it for a meagre profit. Most people working in this sector are migrant workers from the countryside who come to big cities to try to make a living. Further down the street, Guan (who didn’t wish to give his full name) is buying cardboard from a small fruit shop. He has been doing this job for almost eight years and makes a daily profit of £10. 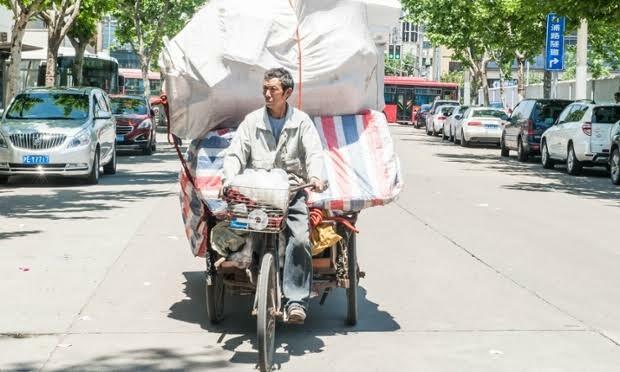 Guan and Jinling are collecting recyclables in one of Shanghai’s most desirable and expensive neighbourhoods but their living standards are very different from the people who live there. The government has little or no involvement in recycling in cities, says Chen Liwen, a researcher for the environmental NGO Green Beagle. “China’s recycling is market orientated, there is no government control from the collection to the disposal of materials,” she says. As China has developed rapidly and its citizens become more affluent, increasing amounts of rubbish are being generated. Shanghai, a city of around 24 million people, currently produces 22,000 tons of rubbish a day and the city is running out of landfill space. Liwen says that more and more waste is being generated and an increasing amount of materials that could be recycled are ending up in landfill. Workers like Guan and Jinling ensure not all materials end up in landfill, but price fluctuations can make the informal recycling unpredictable. If it becomes less profitable for waste pickers to collect and sell a particular material, it’s unlikely to be recycled. For example, the price waste pickers get for glass bottles has recently fallen, so without an incentive of profit, glass is increasingly ending up in landfill. As China’s levels of rubbish grows, the government has looked to incineration. . According to local news reports, four new incineration plants are to be opened in Shanghai and city officials estimate that by 2016, 70% of the city’s household waste will be incinerated. However, incineration is becoming controversial among the public in China due to environmental concerns and there have been protests against proposed plants. In April, plans for an incinerator in Guangdong province in southern China were scrapped by the local authorities after a mass protest. Environmental campaigners also say that incineration doesn’t deal with the root causes of China’s waste problem. “Because you are building more and more incinerators people don’t care about waste, they just throw away,” says Liwen. The government in Shanghai and other cities have made some efforts to introduce centralised recycling systems. Last year, Shanghai set a rubbish sorting target of 95% as part of a three year initiative . But despite efforts public awareness of recycling and waste reduction remains low. Liwen says that the informal recycling system is so widespread and efficient that instead of trying to get rid of it or replace it the government should work with it to improve recycling levels. “I don’t think they should destroy the current informal recycling system. What they need to do is to give them more space, to give them support because the current system is very good,” she said. The circular economy hub is funded by Philips. All content is editorially independent except for pieces labelled brought to you by. Find out more here. The High Court has accepted an application for judicial review over the government’s plan to build a third runway at the airport. The application was jointly submitted by a member of the Land Justice League and a Tung Chung resident. They are seeking to overturn a decision by the Environmental Protection Department to approve an environmental impact assessment report and issue a permit for the expansion project in November last year. The Executive Council gave the final go-ahead for the HK$140 billion project in March. Environmentalists have called on local authorities to step up action against drivers who idle their engines while stopped, after a South China Morning Post analysis of government data showed the practice attracted the least amount of law enforcement attention among an array of minor offences. Out of Hong Kong’s 680,000 licensed, non-government-owned vehicles excluding buses, authorities last year issued 46 fixed penalty notices after traffic wardens timed 1,127 vehicles. Between December 2011, when the ban came into effect, and November 2013, officers timed 3,070 vehicles and issued 86 fixed penalty notices. Motorists are prosecuted if they allow their engines to idle for more than three minutes after receiving a warning. Civic Party lawmaker Dr Kenneth Chan Ka-lok said the number of exclusions – including hot weather and queuing taxis – might have explained the difficulty traffic wardens faced in enforcing the ban. Still, he said more focus would be needed in order to tackle air pollution. Clean Air Network campaign manager Patrick Fung Kin-wai said the curb on illegally idled engines played a “secondary role” in improving air quality. “More awareness is needed; more law enforcement is needed too,” he said. The Post also found that police issued tickets to about 1.06 million drivers last year for illegal parking. It was a slight rise over the 1.02 million tickets handed out for the offence in 2013. Some 20,015 pedestrians were fined for road safety offences last year, including jaywalking, ignoring the directions of a police officer and taking too long to cross the road. That was down from the 23,600 pedestrians fined in 2013. Smoking in unauthorised places was another common minor offence, with more than 8,000 people fined last year. Go to Disneyland instead. You’ll be immersed in Fantasyland either way, but you’ll have more fun with Mickey Mouse than Environment Secretary Wong Kam-sing. Here’s a tip for delegates coming to Hong Kong for an international conference on solid waste: skip our environment secretary’s keynote address. Go to Disneyland instead. You’ll be immersed in Fantasyland either way, but you’ll have more fun with Mickey Mouse than Wong Kam-sing. Wong is expected to recite his “Hong Kong Blueprint for Sustainable Use of Resources 2013-2022”. The part on waste management is as fantastical as Space Mountain, but minus the thrills. To reduce Hong Kong’s Waste Mountain, the Environment Bureau’s goal is to cut by 40 per cent the amount of solid waste disposed of per capita, from 1.27kg per day in 2011 to 0.8kg in 2022 (no matter that the figure in fact increased to 1.33kg in 2013). The bureau insists this is achievable through charging us for the solid waste we produce, along with public education, and cites the success of South Korea and Taipei in shrinking their waste mountains. But the bureau is wishing upon a star. A waste-reduction policy based on reality, rather than wishful thinking, has to follow an inescapable equation: waste disposed is equal to waste generated, minus waste recovered for recycling. Waste charging can reduce the amount of waste generated. But equally essential is increasing the amount of waste recovered and recycled. After introducing waste charging, South Korea reduced the waste it generated by 23 per cent, and increased the waste it recovered from 24 per cent to 60 per cent. Taipei reduced the waste it generated by 62 per cent, and increased the waste it recycled to 60 per cent. The combined effect of generating less garbage and recovering more of it for recycling is necessary in reducing the amount of waste that needs disposing of. A further reality that the bureau wilfully ignores is that waste recovery and recycling is impossible without a mandatory, systematic programme of waste separation. Recyclable waste, such as paper, metal, glass and plastic, needs to be handled separately from waste that ends up in landfills or the incinerator. Such a programme cannot be enforced without legislation. Taiwan has introduced such laws: a Waste Disposal Act and a Resource Recycling Act, which mandate comprehensive waste separation and recycling. Similarly, South Korea introduced a Waste Control Act and an Act on Promotion of Saving and Recycling of Waste. It takes political will to push through such a statutory framework. Key to recovering more waste is a recycling industry that can profitably process such waste into marketable products like recycled paper, glassware, plastic items and building materials. To support its recycling industry, Taiwan has an annual recycling fund of NT$6 billion (HK$1.5 billion ). It has become a leading developer of recycling technology. In South Korea, a government-sponsored Korea Environmental Corporation provides financial assistance to the recycling industry, resulting in a substantial increase in the number of recycling companies in the country. Hong Kong’s pitiable recycling industry does not have the scale or infrastructure to process recovered waste into marketable products. For starters, 93 per cent of recovered waste is exported for sale, mostly to the mainland. In 2003, the government designated an EcoPark for a high-tech, high-value-added recycling industry. Yet the industry remains stuck at the lowest level of operations: collection, recovery and export of waste paper, metal, plastic, etc, activities with low economic value. Relying on exporting also exposes the industry to external vagaries. During the global financial crisis in 2008, for instance, the purchase price of waste paper in Hong Kong plummeted from HK$2,000 to HK$700 per tonne. In 2013, when mainland authorities tightened regulations for importing recovered plastics, 100,000 tonnes of plastic waste piled up at collection points. Without serious and sustained separation of waste to increase the waste recovered, the amount of recyclables is simply insufficient to support the development of a recycling industry. Relying on export, the industry will dwindle as waste exporting options continue to decrease, limiting the amount of recyclable waste that exporters want to recover profitably. The government has made no serious effort to create an indigenous recycling industry. A one-off HK$1 billion fund proposed to support recycling companies essentially only subsidises local companies to recover more waste for export. HK$1 billion sounds like a lot but it’s measly compared to the HK$19 billion budgeted for building an incinerator, HK$10 billion for expanding landfills, and HK$8 billion for a sludge treatment facility. In 2011-2012, the budget dedicated to education, publicity and advertisement of recycling was only HK$24 million. The allocation of funding reveals the priority: building waste-disposal capacity, not recycling. Scattered recycling pilot projects are being tried in some housing estates but none have resulted in a territory-wide programme. The tri-colour recycling bins on the streets collect only 700 tonnes of recyclable waste a year, a mere fraction of the waste generated in Hong Kong. Yet the bureau claims it will increase the rate of recovery from 37 per cent of waste generated in 2013 to 55 per cent by 2022. While the government looks to waste charging in reducing the waste generated, it ignores the other side of the equation: waste separation mandated by legislation and the creation of a viable recycling industry. Yet without these essential components, it aspires to achieve in seven years from now what Taipei took more than a decade to accomplish. There’s a Disney attraction analogous to that aspiration; it’s called The Mad Hatter’s Tea Party. With summer approaching, the resort town of Ocean City, Maryland, will soon see an influx of tourists, their coolers filled with water bottles and soda cans. Vacationers here can also take a break from recycling and toss all their trash — every last bit of paper, aluminum and plastic — in the garbage can, guilt-free. The city ditched its recycling program five years ago, saying that it had become too costly. “It was something that needed to be done,” said solid-waste manager Steven Brown, who says Ocean City has saved about a million dollars by contracting to incinerate all its trash. But don’t call it burning the trash — that’s old school. Here, as in Palm Beach County, Florida, it’s the cleaner-sounding “waste-to-energy” program. And with the cost of recycling climbing each time the price of oil drops, it’s looking better every day, especially as some worry that America has achieved peak recycling with a rate stubbornly hovering around 34 percent. It’s probably coincidence, but recycling levels began to plateau about the time John Tierney wrote a now infamous piece for The New York Times Magazine, titled “Recycling is Garbage.” In it, Tierney said recycling may be America’s “most wasteful activity” and railed against government-mandated programs that created “a glut of paper, glass and plastic that no one wanted to buy.” This was in 1996, 16 years after Woodbury, N.J., was the first American municipality to implement mandatory recycling, with other cities eagerly following. In a 2012 report, the Environmental Protection Agency estimated that for every 4.38 pounds of trash they produce, Americans recycle about 1.51 pounds. When broken down by types of material, the rate can drop even lower. The recycling rate for plastics is about 23 percent, despite the billion water bottles sold every year. An anemic recycling rate is not unique to America. In the United Kingdom, they call it “green fatigue” — an initial burst of enthusiasm at the prospect of saving the planet, worn down by years completing tedious tasks like rinsing out peanut butter jars or prying off labels with no discernible difference to the environment. The Great Pacific Garbage Patch still floats between California and Japan, a sickening amalgamation of fishing nets, particles of plastic and random ocean-faring detritus. A plastic bottle will wear down — after 450 years. The major problem with recycling for municipalities, however, is not the stagnant participation rates, but the cost. The city loads its trash into tractor-trailers that truck the waste to a commercial incinerator in Fairfax, Virginia; the heat and steam turn turbines that produce electricity. For every ton of trash that is burned, 670 kilowatts of electricity are created, Brown said. After incineration, any remaining metals are recycled. Some Ocean City residents didn’t like the idea at first, “but most understood that it was a cost-saving venture for us,” Brown said. Those who wish to recycle still have the option of taking recyclables to county facilities, and Ocean City still recycles the more profitable white metals, and offers bulky item pickup for its residents. Recycling costs cities and towns in dual collection and sorting. Sometimes there is a payoff in the sale of recyclables, but that small profit shrinks further as oil prices diminish. When oil prices are low, it’s cheaper to make new plastic than recycle, leading one New York recycler to complain to a reporter for Crain’s, “Prices for recycled plastic are so low now, it’s not worth stealing anymore.” New plastic now costs 67 cents per pound, compared to 72 percent for recycled, Crain’s Plastics News says. Of course, there’s another way that cities can profit from recycling: Charge for it. The town of Worcester, Massachusetts, grappling with how to pay for its recycling program, recently proposed monthly fees for it. While the goal, ironically, is to keep more recyclables out of landfills, one councilman told the Worcester Telegram, “It bothers me that the people who will hurt the most are the ones who faithfully and conscientiously recycle.” The matter is scheduled for a vote on May 20, but many Worcester residents are lobbying against it. It’s unlikely the nation will ever enter a post-recycling age, but with many towns considering incineration, one Florida county is emerging as a model with its three-pronged approach to solid waste. Palm Beach County made headlines when it proposed opening a massive incinerator that would also accept waste from outside the county. It is part of an integrated program that also includes landfills and recycling, said Willie Puz, director of public relations and recycling for the Solid Waste Authority of Palm Beach County. The county chose to build the $670 million incinerator when the local residents rejected its alternative: a new and larger landfill near the Everglades. When it fires up in June, it is expected to burn a million tons of garbage each year and add 30 years to the life of the existing landfill. In addition, the county operates seven household hazardous waste drop-off sites and a biosolids processing facility that convers wastewater sludge to fertilizer, leaving the landfill as a “last resort” for waste. As for the nation’s seemingly lackluster rates, Puz offers a sliver of hope: that reduced tonnage could reflect, however, small, a society-wide reduction in consumption. For example, with more people reading online, fewer print newspapers are published, and many of those that are have smaller dimensions. As manufacturers look to find ways to shrink packaging, even plastic bottles and aluminum cans take up less space. Ten years ago, Puz said, 31 bottles made a pound of glass; now 49 do. Jennifer Graham is an East Coast journalist and author. On Twitter, she’s @grahamtoday. The Hong Kong Environmental Protection Department (EPD) has awarded a design, build and operate (DBO) contract for a 30,000 tonnes per annum (tpa) waste electrical and electronic equipment (WEEE) treatment and recycling facility. To be built at the EcoPark in Tuen Mun, the contract was awarded to ALBA Integrated Waste Solutions Hong Kong Limited (ALBA-IWS) following an open tender. The Government has earmarked HKD$550 million (US$71m) for the building of the project and its operating cost. ALBA-IWS is a joint venture comprising ALBA Asia, German recycling technology firm Erdwich Vertriebs GmbH and a local collection firm, IWS Environmental Technologies. An EPD spokesperson said that commissioning could start by 2017. In March, a new bill was introduced to Hong Kong’s Legislative Council to encourage WEEE recycling. Called the Promotion of Recycling and Proper Disposal (Electrical Equipment and Electronic Equipment) (Amendment) Bill 2015, it includes refrigerators, washing machines, TVs, among others. Manufacturers and importers of regulated electrical equipment will be required to register as registered suppliers and pay a recycling fee for regulated electrical equipment that is distributed in Hong Kong. The cost of expanding Terminal 2 at Chek Lap Kok airport to support the proposed third runway could soar to HK$14 billion by the time work begins in 2019 – 47 per cent up on the original prediction, a veteran engineer says. The Airport Authority plans to shut down the terminal, which opened in 2007, for construction work to improve arrival and transit facilities. The building currently houses 56 passenger check-in counters, restaurants and shops, but no arrival hall. Greg Wong Chak-yan, a former president of the Hong Kong Institution of Engineers, said his estimation was based on construction costs rising 5 to 6 per cent per year until 2019. The original prediction by the authority was HK$9.5 billion in 2010 prices. The expansion work will involve extensive excavation and will see the terminal out of service until 2023. Wong’s estimate came as opponents of a third runway warned yesterday the runway project could run into the same troubles as the new high-speed rail link to Guangzhou, which has been dogged by legal and constitutional issues involved in arranging immigration checks. Opponents say the capacity of a third runway would be affected significantly by the ability of local authorities to coordinate airspace with mainland authorities. Hong Kong is responsible for providing air traffic services within its flight information region, according to Article 130 of the Basic Law. Engineer Albert Lai Kwong-tak, from think tank Professional Commons, said if the third runway project ran into trouble, the problems would be even worse than those of the over-budget and delayed rail link. He said construction projects across the Pearl River Delta requiring reclamation could jack up sand prices significantly, adding further uncertainty to the cost of land formation for the airport. Wong believed the layout of the terminal building would be completely changed and that “only steel beams would be left” after the installation of additional facilities. However, a spokesman for the authority would not say how far the basic structure of the building would be altered. “The [authority] has analysed the structural limits and potential impact on the existing building, including the related modifications and addition works,” he said. Waste disposal remains a hot topic in Hong Kong, especially since the controversial incinerator project for Shek Kwu Chau, off southern Lantau, was – against all logic – finally approved. Everything about this project is wrong: a remote location with high scenic amenity; exorbitant projected costs; outdated incineration technology; prevailing summer winds that will blow noxious fumes back towards the city’s most built-up areas, where air pollution is already a critical problem; and the cost of transporting solid waste there and removing the resultant ash. Nothing makes sense except that the whole exercise provides a profitable boondoggle for those in the powerful construction sector, who will directly benefit. Brownfield sites around Tuen Mun, where the ash will eventually be transported for concrete making purposes, are by far the best locations for such a facility. But all were rejected for the flimsiest reasons. None of the relevant officials were prepared to admit publicly that – as ever – powerful northwest New Territories vested interest groups simply wouldn’t accept an incinerator in their own backyards. Because what passes for government these days has no meaningful control in that part of Hong Kong – as recent parallel trading protests have demonstrated – sensible options were rendered politically and practically impossible. Our hapless Environmental Protection Department officials knew it. And that was the end of the matter. But how was Hong Kong’s urban waste disposed of in the past? Until relatively recent times, there wasn’t that much. Large quantities of rubbish indicate generally affluent societies that can afford to throw things away. The truly poor never dump items that might have further use; they simply cannot afford to do so. And until recently, Hong Kong and a large number of its people were overwhelmingly poor. Metal cans and glass bottles were collected for their scrap value. Old newspapers were gathered, sold and reused for market wrappings before non biodegradable plastic bags made an appearance. Other paper scraps became kindling for solid-fuel cooking fires. Faeces and urine were highly prized as agricultural fertiliser in traditional China. Collection and resale of nightsoil – yeh heung, or “midnight fragrance”, as human waste was euphemistically called – ensured that more than a few local fortunes owe their beginnings to the recycled contents of a crockful of You-Know-What. These days, waste separation in Hong Kong is – for the most part – a done-for-show middle-class gesture towards greater environmental awareness. Most domestic waste remains unseparated and – in the absence of any meaningful glass recycling or municipal composting services, for example – why wouldn’t it be? All that waste that is meticulously divided by well meaning families goes into the same overflowing landfills. Widespread cardboard scavenging and paper recycling, sadly, doesn’t signal the growth of greater environmental consciousness; it merely demonstrates that Hong Kong’s already catastrophic wealth chasm continues to widen. Legions of old people with no meaningful government retirement protection (despite billions of dollars deployed on “white elephant” infrastructure projects, such as the Shek Kwu Chau incinerator) gather up flattened cardboard boxes late into the night all over Hong Kong. The very sight of them is an ethical reproach to a society with Hong Kong’s trillion-dollar fiscal reserves. Some form of basic-but livable old-age pension scheme would barely dent this colossal hoard – and most recipients will be dead within a decade anyway. As Hong Kong is lagging behind its neighbors in ridding its mounting waste, a Recycling Fund established to thwart an imminent waste crisis, stakeholders say, wouldn’t serve its purpose unless it’s put to good use. Ming Yeung writes. The Hong Kong government has long realized that the city’s waste will soon have no final resting place, forcing it to kick start a Recycling Fund with a planned HK$1 billion injection to make it tick. The government’s prolonged bid to expand the three existing landfills — at Tseung Kwan O, Ta Kwu Ling and Tuen Mun — and to build an incinerator at Shek Kwu Chau, north of Lantau Island at whatever costs has become snarled though, running into acrimonious public protests and debate. The Environmental Protection Department (EPD) said the SAR recycled only 2.16 million tonnes of waste in 2012 — 860,000 tonnes less than the year before. Of the total recycled figure, about 60 percent of the decline was said to be the result of a drastic drop in the trading of plastic waste, of which 320,000 tonnes were recycled in 2012, compared to 840,000 tonnes in 2011 and 1.58 million tonnes in 2010.